Richard III, directed by Wang Xiaoying and performed by the National Theatre of China during the Globe to Globe Festival, Saturday matinee, 28th April 2012, London. The train before mine was cancelled when I made the trip down from York to London last weekend – it has been raining for days and there is flooding across many places in the UK. 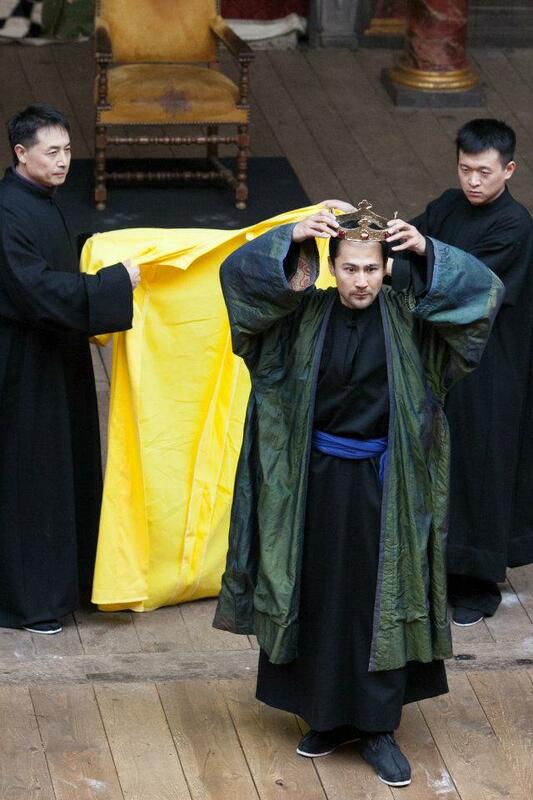 This is an important detail for this review, believe it or not, so keep it in mind… I came down to see the National Theatre of China’s Richard III, which was taking part in the Globe to Globe Festival at Shakespeare’s Globe Theatre. I had high expectations. 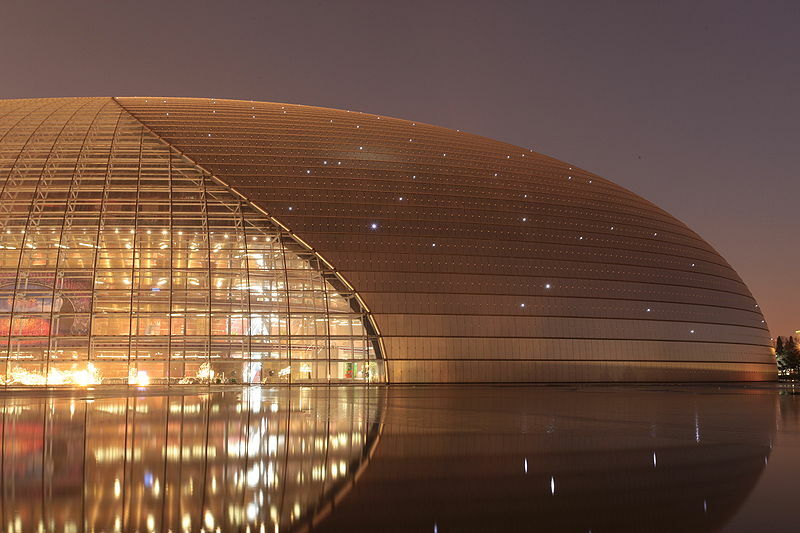 The NTC draws on three of Beijing’s most prestigious theatres for its practitioners and is housed in the spectacular National Centre for the Performing Arts, designed by Paul Andreu. I remember wandering through the old Beijing courtyard streets, or hutongs, last winter, past red paper lanterns and hole in the wall restaurants and bicycles propped against grey brick walls, the last vestiges of the Beijing I first visited in the early 1990s. Then, as I turned a corner, I was confronted with the spectacular, postmodern glass dome, or ‘Bird’s Egg’, as the theatre is popularly known, rising out of a man-made lake. Inside the building, as I walked down into the exhibition area, I glanced up and realised that this lake formed part of the roof. Even in the weak winter sunlight, the rippling water above me sparkled and shimmered and made me think of things rich and strange. These things I found in abundance – quite literally – in the exhibition, which displayed costumes and set designs from previous productions, including Zhang Yimou’s magnificent, if controversial, Turandot, revived at the Bird’s Egg in 2009. There were samples of the lavish velvet and silk gowns, embroidered with thread of gold, for the large intercultural cast. You’ve seen the Beijing Olympics Opening Ceremony; you know what I mean. In fact, the NTC and its building is part of the lasting legacy of China’s cultural Olympiad. So I was surprised when I saw the first publicity images for their touring production of Richard III: a general in a uniform that resembled that of the KMT (guomingdang), Chiang Kaishek’s Nationalist Party in the 1930s and 40s. 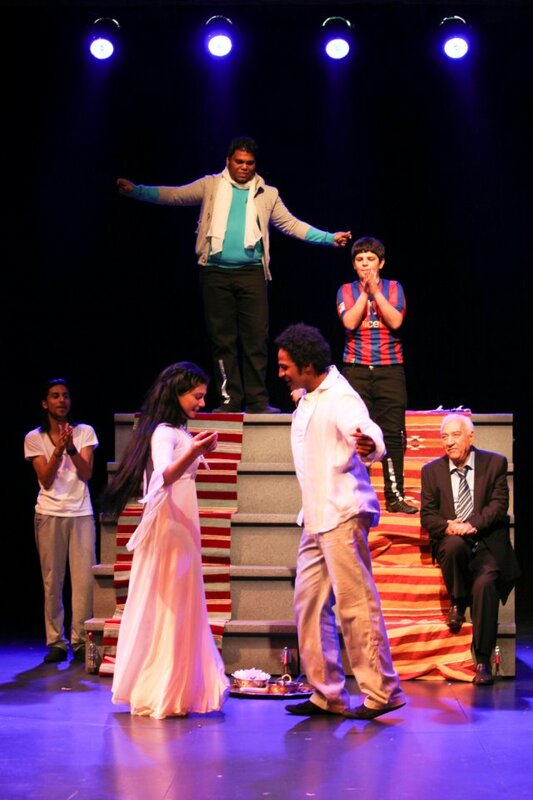 Such contemporary and politicised huaju, or spoken theatre, is not so often exported to the West, other than to avant-garde theatre festivals. In my personal opinion, this is a shame. It may not seem so invitingly, if problematically, Chinois – or culturally ‘exotic’ to Western eyes – but it is as Chinese, fundamentally tied to modernisation strategies and constructions of national identity in the 20C. However, in the last couple of weeks, the Chinese production image on the Globe to Globe website has been updated. Richard III, now with a jewelled crown, wears a lavish velvet and silk gown, embroidered with thread of gold, evocative of some non-specific, Oscar-nominated martial arts film notion of mediaeval China, or Turandot. He is surrounded by three women in masks, looking like they have stepped out of A Chinese Ghost Story. I’m not too disappointed, however. It’s not such an adventurous choice, but I love theatrical spectacle, and bearing in mind that this production is for an international festival, that has opted to have ‘scene settings’ rather than word for word surtitles, it is likely to be far more accessible to a non-Chinese speaking audience, than perhaps Lin Zhaohua’s experimental appropriation of the same play, reflecting on the Cultural Revolution. This is because, to most people under the age of 40, the Cultural Revolution no longer has any resonance (some would argue ‘even in China’), but also because, thanks to blockbuster films like Crouching Tiger, Hidden Dragon, rather than the intercultural theatre of Ariadne Mnouchkine, these images have already been absorbed into Western performing arts and the moving image. As critic Alex Huang points out, there is an orientalising danger in these productions on the part of the Western spectator; however, it is also part of China’s canny marketing of its heritage on the global stage. Think Merchant Ivory. But let’s get to the performance itself. It was a Saturday afternoon and the theatre was packed – families, students, Chinese, non-Chinese. 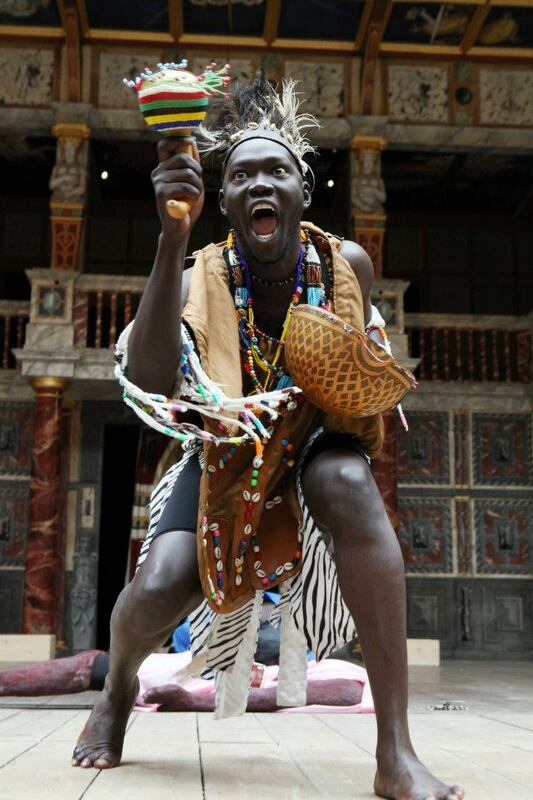 Among the aims of the Globe to Globe festival is to target the communities who share a language with the productions and to bring new audiences to Shakespeare. They had certainly succeeded with the first, and judging by the youth of much of the audience, including a high percentage of Chinese students, they appear to have succeeded with the second. The Globe is an appropriate place for Chinese theatre, because its ornate, outdoor thrust stage has many similarities with traditional Chinese outdoor theatres. In fact, the stage at the ancient library in the southern city of Ningbo is remarkably close in design, although, of course, most theatres in China are indoor prosceniums these days. A red sign emblazoned with black Chinese characters sat on two chairs centre stage. ‘That must say Richard III,’ commented the woman sitting behind me. I looked at it more closely. Yes, it must, but something was wrong. I was sure the Chinese title had four characters, not two, and anyway, the character for ‘third’ should have been three horizontal lines, not three vertical lines. The man sitting the other side of me leant across and whispered, ‘My Chinese friend says it’s a trick – it’s English…’ I saw it immediately, now that I knew: it was square-word calligraphy, in which Roman letters are arranged in a box to simultaneously reflect the English word (Richard, in this case) and resemble the strokes of a Chinese character. 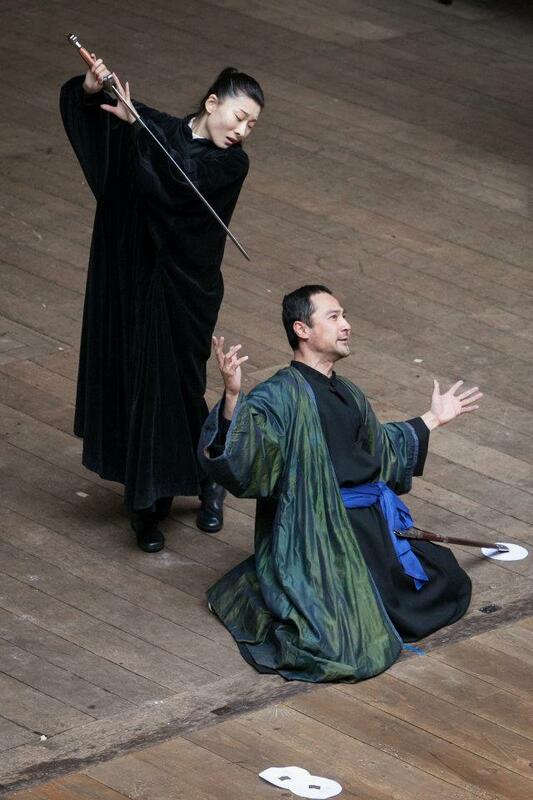 This encapsulated this production as a whole, as Shakespeare’s text was reconfigured through traditional (and non-traditional) Chinese performance codes to produce a performance that is recognisable but completely new, something that is intentionally designed to cross continents and cultures. 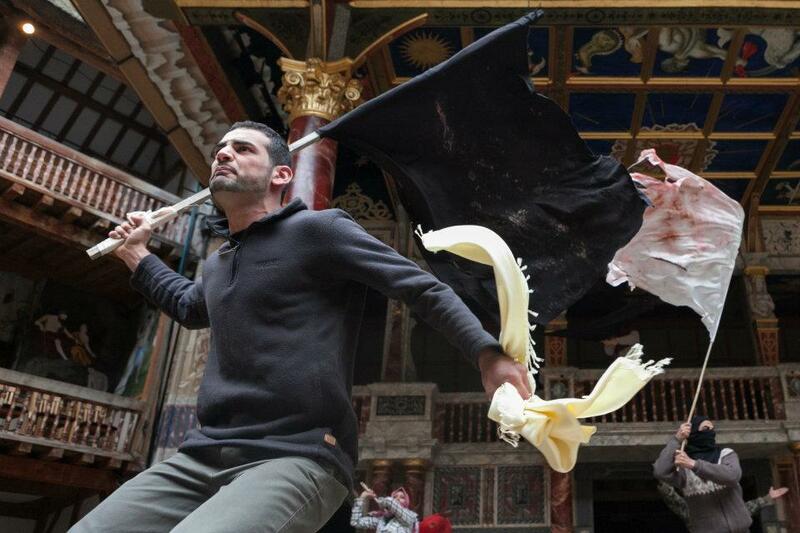 Li Ruru, author of Shashabiya: Staging Shakespeare in China, explores this further on the Shakespeare’s Globe Blog. The chairs on stage looked a little battered, and a table in front of the ‘throne’ looked decidedly like a coffee table, not really reflecting the prop designs I was imagining from my visit to the Bird’s Egg. Then Dominic Dromgoole, the artistic director of the Globe, came on to introduce the company. So the cast performed mostly in an array of black robes that looked like they had been recycled from Doctor Faustus, or black martial arts practice kit, apart from the emperor(s)/king(s), who wore a lemon yellow cotton dressing gown to indicate status. This, of course, was nothing like the Imperial Yellow robes that were bobbing about on the storm-tossed seas, but it didn’t matter a jot. This performance reminded the audience that costumes and props are not always so integral to the mise-en-scene, especially, as I suggested earlier, in a depoliticised reading of this play. We were soon roaring with laughter and appreciation. The production was huaju, spoken theatre, but had incorporated many elements from traditional theatre forms such as Beijing Opera, jingju. For example, battles were symbolically choreographed as a flag-dance between the standard bearers. Whilst the sparkling eyed villain Richard confided to the audience with early modern/Brechtian candour, he was largely naturalistic. In contrast, Lady Anne delivered her lines with the high-pitched, stylized recitation style of a Beijing Opera female role. Likewise, her movements were slow, with very specific hand-gestures. Because the sound of Beijing Opera is very different from Western Opera, this can seem strange, sometimes alienating for Western audiences, if also hauntingly beautiful, yet this added to the effectiveness of the juxtaposition, because another person’s grief is alienating and difficult. Its sudden intrusion into the duologue also added a sense of intercultural distancing. We stopped and noticed the hybridity, just as we had when we took a second look at the square-word calligraphy. Or at least, the Western and older Chinese audience did. 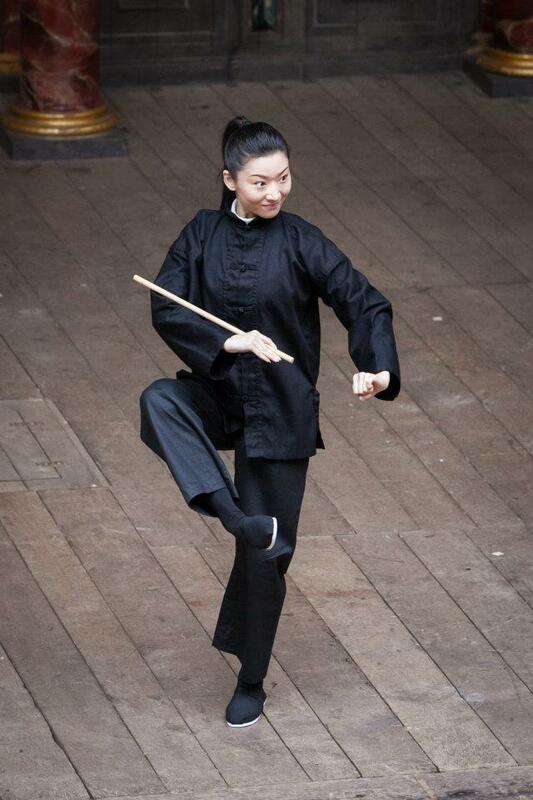 For many young Chinese, new to theatre going, this increasingly Sinocised form of huaju may become the norm. The mixing of forms is often not as overt as in a touring/tourist production such as this, but it is there nonetheless. The production’s East/West audience also meant that it simultaneously contained different culturally specific semiotic codes. Thus, Chinese in the audience may have read Queen Elizabeth’s white handkerchief as an omen of her husband Edward’s demise, because in China white, not black, is the traditional colour for mourning. After his death, she wiped his throne with it as if mopping his brow, unable to let go. Despite these moments, the NTC played Richard III as tragicomedy. The actors are not allocated to roles in the programme, but I think that Richard was played by Zhang Dongyu. He reminded me a little of Derek Jacobi in the Renaissance Theatre production I saw many years ago. Jacobi’s Richard was Vice, seducing the audience, stirring up the crowd, and making us understand, in a way that Ian McKellan’s terrifying film villain will never make us understand, just how the fictional Richard got away with what he did. Zhang’s Richard shared many of the same techniques, if not the exact same cultural connotations: he entertained us with his villainy. When Lady Anne spat in his face, he lasciviously rubbed it in, like a man in an aftershave advertisement. Interestingly, however, in a borrowed green Globe coat and relocated into this nominally Christian space, he suggested the prelapsarian serpent, too. The two murderers were also comic – quite literally, their moves and facial gestures were those of the chou or traditional Chinese opera clowns. This was verified for me the next day, when pictures of the performers in their costumes in China were put on display in the foyer. The murderers wore the jingju make-up of the comedic character roles. As the noble Clarence slept, the murderers, who had just bamboozled the Keeper, crept around the stage, sharpening their swords on the soles of their shoes, then grappling with their soul’s conscience by signing themselves with the Christian cross, then sitting down to waste time and counting ‘one, two, three’ in English. When Lady Anne later doubled as the Young Prince, s/he carried a stick and pranced into London on an imaginary steed. If the props had arrived, the crop’s tassels would have indicated even more clearly that we were meant to see a horse. 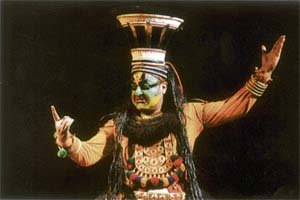 This production did not only borrow from other forms, however; it also borrowed from other texts. The prophecy about ‘a man whose name begins with G’ was brought by three witches as the play suddenly seemed to morph into Macbeth. Queen Margaret, bent double with a gnarled walking stick, transformed into a formidable sorceress as she cursed the new king and his family. Then, in the most powerful visual representation of the play, she came back to curse from the heavens as each character met his or her death. This was most magnificent and most moving when Clarence finally succumbed to the murderers. He may have been standing on a coffee table, but it did nothing to diminish the pathos of the moment as they stood in tableau, his arms stretched out, the murderer-clowns’ swords thrust through him. Instead of falling to the ground, however, Clarence stepped down, the assassins’ threw a black cloth over his head and shoulders, and thus veiled he left the stage, a dead man walking. This motif recurred with chilling predictability throughout the rest of the play. 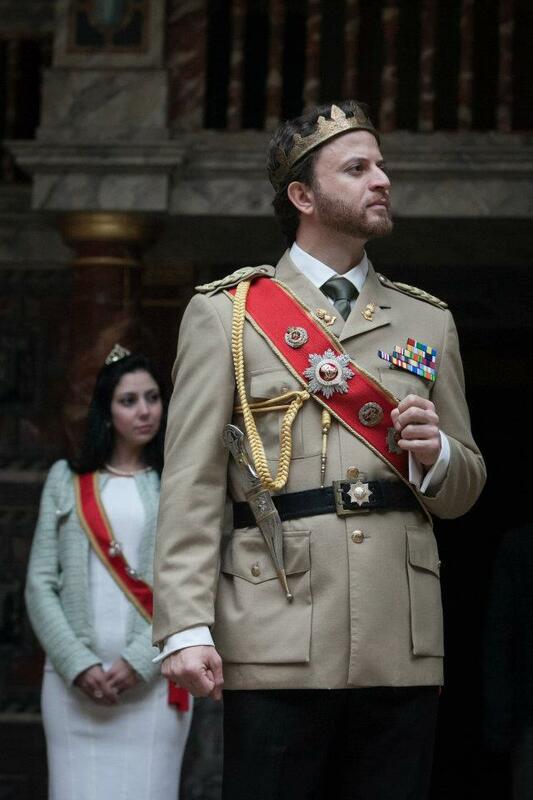 Macbeth echoed again when, as king, Richard drew on red gloves. This was not an intellectual, existentialist meditation on power, corruption and deceit, but it was thought-provoking. Richard’s deformity was only visible to the audience in moments of extremity when his body twisted to embody his thoughts. As he hid under the coffee table during the curse of his nightmarish last night, writhing like a snake disturbed in its hole, I felt pity as well as disgust. And he entertained us until the very end – charging courageously into battle, and even momentarily coming back from the dead to croak, hilariously by the third time, ‘My horse, my horse, my kingdom for a horse!’ 要一匹马！ 要一匹马！愿以王位许之！Which was the only phrase, other than combinations of common verbs and pronouns, that I could fully understand in the entire production! The costumes would have added to the spectacle, but the lack of them did nothing to diminish the impact of the players on the stage.